A Guide To Basic PC Cooling. One of the greatest dangers to your PC is something we all take for granted… Heat! Your office space may be cool enough for you, but is it for your PC ? Desktop PCs and Notebook PCs generate heat that can be damaging to its components. Not just damaging, but heat can actually reduce the performance of your PC – slowing down processing, and causing intermittent errors that can affect your stored data. 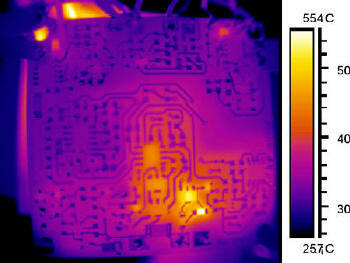 A Thermograph of a pc board showing hot components. Whether you’ve just bought your Desktop or Notebook, or you’re a long-time owner, here are some tips that will help lengthen the life of your precious personal computer. The manufacturer of your PC understands the issues that can affect your PC. They have gone through the testing to understand how and when your PC can fail. That’s why, it’s important to review the owner’s manual, and follow the manufacturer’s suggestions on how to use, and maintain your computer. Pay special attention to any discussion of cooling, and the placement of the computer. The truth of the matter is, anything that consumes energy generates heat. The power supply, the processor, the graphics card, the hard drives, and all the other components of the computer that require power for it to function generate heat. The amount of heat depends on the device – for example processors and video cards generate HUGE amounts of heat. You have probably noticed at one time or another, the big finned heat-sinks (cooling devices) on some of the components inside your computer. These are there to help preserve the useful life of these devices. It is true that all personal computers, whether they are Desktop PCs or Notebook PCs, come with a cooling system. 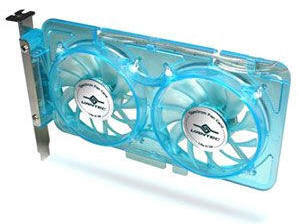 However, the standard cooling system that comes with your PC may not ultimately be adequate for the PC you now have. Plus, to work efficiently in protecting your PC from overheating and possible damage, several things have to be considered. In PC Cooling – Bigger Is Better! Keep Cables Neat – the cables inside your computer can become a block to proper airflow, so be sure they are organized so that they do not restrict airflow. Dust – accumulating dust inside your PC can be deadly. It acts to insulate the devices it covers, keeping heat in, plus dust clogged fans and vents restrict the amount of airflow possible. Keep your PC blown out and dusted regularly. Fans – periodically check your PC’s fans to make sure they are working effectively. Fans can fail, resulting in significant reductions in airflow – in some systems a single fan failure can be enough to damage your PC. Covers On Tight – your PC’s chassis was designed for proper internal airflow across the various components. 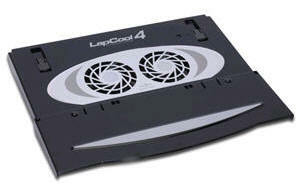 However, if your PC’s enclosure is open, this then dramatically changes the cooling dynamic. It can reduce or eliminate cooling of some components altogether, so make sure the case’s cover in on tight. Have you added new hardware to your PC? A new motherboard, video card, or hard drive? Did you upgrade the cooling at the same time? I bet you did not! This is the perfect time to look at a cooling or power supply upgrade! 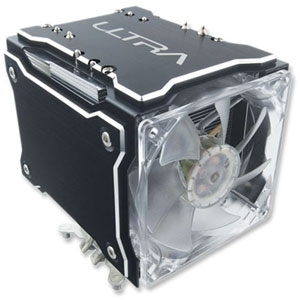 The typical PC relies heavily on its power supply’s fans for cooling. Also, most original equipment power supplies don’t have much margin for additional upgrades, so your power supply may be working at or near 100% capacity. Therefore, the answer is to upgrade the power supply with a model that will not only meet your power needs, but also include more robust cooling. A power supply replacement is generally easy to perform, and can extend you PC’s life (especially since old power supplies are generally what kill most PCs). We previously mentioned airflow inside the PC, but airflow around the outside is just as important. Blocking the exhaust or intakes can reduce the internal airflow substantially. Set up your personal computer away from other equipment or appliances that generate heat. Keep your personal computer away from direct sunlight, and make sure that your PC is placed in a well-ventilated area. Placing Desktop PCs and their monitors flat against walls or in enclosed areas should be avoided – leave at least 6 inches of space between the back of the PC and the wall. Desktop PCs have ventilation fans at the rear of the unit, and depending on its design, may even have ventilation fans on its sides, top, or at the front of the unit. Make sure that these ventilation fans are not blocked in anyway as to constrict the airflow that is needed to cool the internal components. Some people place their Desktop PCs on the floor. While this may save your desk space, having your PC on the floor also makes it more susceptible to dust (and animal hair if you have pets in the house). 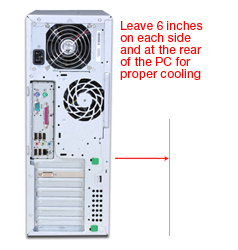 It is safer to keep your PC off of the floor to minimize foreign matter from entering the computer case. Avoid placing the Desktop PC near drapes as they may end up blocking the ventilation of the computer case as well. Notebook PCs should not be placed on soft surfaces, such as a bed, couch, or on top of a pillow which can allow the PC to sink into the soft material blocking the ventilation holes needed to circulate air through the computer. Using your Notebook PC on a hard level surface, such as a table is probably the best way to keep your notebook working within its optimal temperature range. Always make sure to keep your personal computer clean. Cleaning the exterior is not enough. Make sure you know where all the ventilation intake and exhaust openings are, and make sure that these are not obstructed by objects, dust, dirt, foreign matter, or by any of your personal computer’s components. If you own a Desktop PC, it would be a good idea to clean the inside of the personal computer at least twice a year. Accumulated dust and lint can clog heat sinks and fans found inside the personal computer. This will result in a drop in cooling efficiency which can lead to the personal computer’s components overheating and eventually failing. Heat sinks only work if they are kept clean and are in direct contact with moving air to transfer heat from the heat sink fins to the cooler air around it. You can clean them off using a vacuum cleaner, a blower brush, or a can of compressed air. As a rule, you can use the vacuum on the outside of the PC, and compressed air inside – to minimize the chance of accidental damage to your PC. If you have a Notebook PC, it would be a good idea to send it in for regular maintenance. A competent computer technician can open up your Notebook PC and make sure that the internal components are kept free of dust and that its fans or heat sinks are clean and functioning to ensure proper air flow, and cooling efficiency. But at a minimum, use compressed air to keep openings clear of dust. Another tip for notebook owners is to buy a supplemental cooling pad – these contain larger cooling fans that blow upward to help keep your laptop cool. Keeping a cool PC isn’t luck, it’s maintenance to be sure, but it is also being proactive, and that means improving the cooling performance of your system. Some manufacturers do a great job designing their systems for thermal efficiency, but other may cut corners on critical cooling components. The good news is that you can improve your PC’s cooling performance very easily. In planning for a cool system, Heat Sinks are the first line of defense. They come in all shapes and sizes, and serve many different components. CPU Coolers – CPUs dies quickly without a heat sink, but the quality and efficiency of the heat sink can have a big impact on performance and system life. Upgrading your CPU cooler is a real life-saver. RAM Memory Coolers – often overlooked, your RAM memory also produces its share of the heat load of your PC, and cool running RAM can also play a role in maintaining the highest level of performance. Few systems come with efficient RAM coolers, yet they are inexpensive and easy to install. Slot/Bus Card Coolers – these are fan arrays that pug in and are powers off of the PCI bus connector. Vantec Spectrum PCI Fan Card with a Blue UV LED! Video Card Coolers – supplemental coolers for your video card can improve performance, reduce system internal hot spots, and extend video card life. 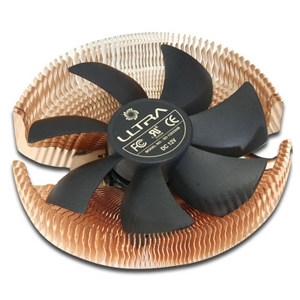 Thermal Electric Component Coolers – these are basically heat sinks coupled with fans for more efficient cooling. Liquid cooled internal radiators – these use liquid to conduct the heat away from the component to an internal fan driven radiator. A Radiator for your PC! Liquid cooled external radiators – these use liquid to conduct the heat away from the component to an external fan driven radiator. When purchasing a new PC, some advanced planning can save you the trouble of dealing with an overheating PC. Choose a Desktop PC case which is large enough to easily accept all the components you wish to install, and still have strong airflow. A good case with enough breathing room will help deal with cooling issues well into the future. However, if you are building a system, buy a case with extra ventilation to be on the safe side. If you are installing multiple hard drives, do not stack them one on top of the other (if possible). Skip a drive bay to allow air to flow between the hard drives. Keep your cables tidy. 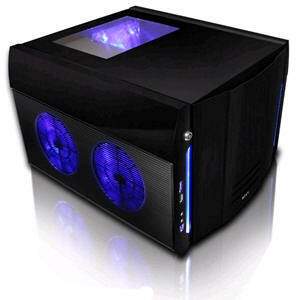 Tucking them to the side opens up the airways and lessens air turbulence inside the Desktop PC case increasing airflow. Likewise, choose a good power supply unit equipped with a large fans to efficiently extract the hot air from the Desktop PC case. Make sure the CPU cooling system is adequate and be sure that the CPU heat sink is installed per the manufacturer’s requirements. The same for your video card – be sure it also has adequate cooling, since the CPU and video card tend to be the devices that produce the most heat. Notebooks that feature AMD processors tend to run hotter than Intel processors. So if you have an AMD processor notebook, pay special attention to the cooling of your computer. If you have a Notebook PC and you use it hours on end, a good purchase will be a Notebook PC cooling pad which is equipped with fans to cool the underside of your Notebook PC by ensuring adequate airflow across the ventilation openings. Notebook cooling pads operate very quietly, but they are available in less efficient silent fanless design as well. Follow these tips and your Desktop PC or Notebook PC will give you many years of reliable service. 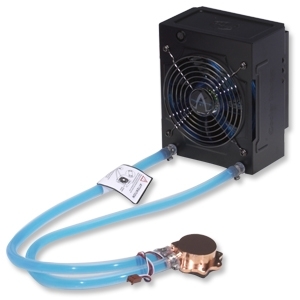 For high performance systems, you might want to consider upgrading your PCs cooling system to the latest liquid-cooled or noiseless systems. You can also boost the cooling efficiency of your current system by adding cooling devices that focus on the individual components in a Desktop PC system such as CPU fans and heat sinks, Chipset fans and heat sinks, hard drive coolers, graphic card coolers, and case fans. You can also check out our guide on Advanced PC Cooling for tips on how to keep high performance components cool even under extreme load. Previous Previous post: We’re here by chance or by design…if God. Next Next post: April Pranks Were Harmless.